They got Biden. They got C.K. They even got Schrempf. And they had Swanson the whole damned time. 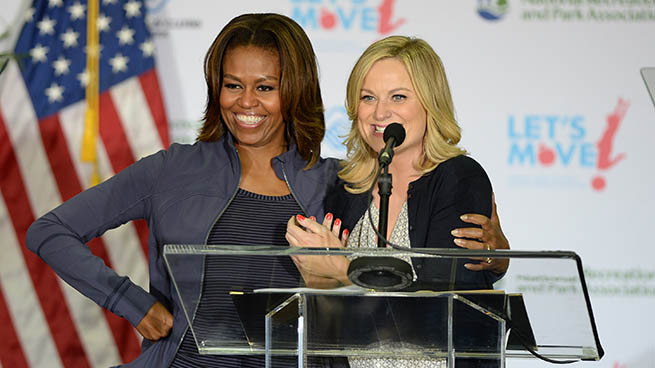 But Parks and Rec is about to one-up every comedy around town with a Michelle Obama cameo in the hour-long Season 6 finale on April 24. The episode filmed in February in Miami, so that’s some stellar secret-keeping. Jurassic World watch: Jeff Goldblum HAS NOT been called. Deduct two excitement points, replace them with one consternation bracelet. Kanye West and Hype Williams filmed the Yeezus Tour and they’re sending it to theaters. Rihanna will release a concept album in tandem with — and about — DreamWorks Animation’s children’s movie Home, coming this November. If you expected that, kindly alert someone that you’re a prophet. 1.9 million people watched the Season 2 premiere of The Americans. Were you one of them? Why would you not be one of them? Be one of them! Daft Punk will tour for the first time in years, but they won’t get to use their craziest idea. Adore Lupita Nyong’o but don’t wanna see Non-Stop? Here’s everything she does in the movie. David O. Russell evacuated the ABC country-club drama he was going to executive produce. The show goes on, though. Feast on a few Sin City 2 photos featuring Joseph Gordon-Levitt, Jessica Alba, and Mickey Rourke. And R.I.P. Jim Lange, 81-year-old veteran game show host.